A wireless service provider has agreed to drop its lawsuit against Los Angeles County over proposed wireless antennas in Hacienda Heights under one condition — that the county approve a permit that residents have vehemently opposed for almost four years. Cell phone company T-Mobile West wants to mount wireless antennas to an existing 151-foot Southern California Edison hilltop tower between South Frame Avenue and South Holmes Circle to improve reception in the area. “Cellular companies don’t belong in neighborhoods,” said 34-year Hacienda Heights resident Cheryl Sewards. “Right now in our little community, we’re going to have three cellular companies in the area … that are not even a block away from each other. “Our neighborhood is (saying), ‘We don’t want it, we don’t need it,’ and it doesn’t make any difference,” added Sewards, whose home is 100 feet from the proposed antenna site. Residents have faced an uphill battle over the proposed project since July 2007. Between September 2008 and February 2009, the permit was approved twice by county officials and appealed both times by dozens of residents, including 13-year resident John Chen. “Our residents and community are really, really concerned about health problems,” said Chen, president of the Broadmoor Monaco Crest Homeowners Association, a coalition of residents who live in the area where the company is proposing to mount the antennas. 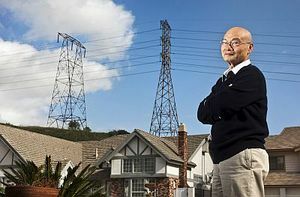 “Most people don’t like how close their homes are to the antenna, and it is not necessary,” Chen said, adding that the antenna would destroy the native habitat and reduce property values. Suzanne Fratto of Hacienda Heights makes an interesting point in her letter to the editor. Chen should examine his motives behind instituting the Confucius Classroom in the first place. My question is: If it is necessary/important to teach Chinese culture/language to the students in Hacienda Heights, why then is the program not being offered to the students in La Puente? Is not the district comprised of both communities? I was told by another board member that “there were not enough Chinese students in La Puente” to offer the program. Again, if it is necessary/important for the education of the district’s students (and use of district funds), should it not be important to all the students? A plan calling for more open space in Hacienda Heights hit a roadblock Tuesday when the Los Angeles County Board of Supervisors opted to put off their decision because of opposition from several landowners. Hacienda Heights residents have worked four years to craft an updated policy that would make for more open space, more bike trails and preserve native habitat. The document, which was expected to be approved by the board, would replace the original general plan from 1978. But several speakers at the Board of Supervisor’s meeting opposed the proposed zoning changes, saying they would decrease their property value and limit how they could develop their properties. Learn about the property owners’ concerns in Juliette Funes story at PLAN. Some people will give you the shirts off their backs. Hacienda La Puente Unified will, too. In fact, students estimate they collected more than 50,000 shirts and other items of clothing last week for the Union Rescue Mission in downtown Los Angeles. “Their generosity sends chills down my back. It’s really encouraging to see our youth step forward to help us,” said Christopher Strode, business relations manager for the mission. 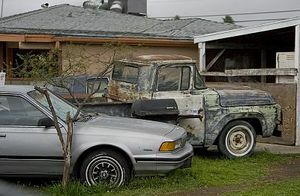 Strode noted that there are 48,000 homeless in the greater Los Angeles area, including the San Gabriel Valley. This includes more than 5,000 families who are the new homeless. Read about the charitable project in Richard Irwin’s story at CLOTHES. Nearly half of the homes that the county has declared public nuisances are in the San Gabriel Valley, including Hacienda and Rowland Heights. Now officials are stepping in to make the owners clean them up. “This is part of a process when a property is cited for code violations and (owners) are given an opportunity to fix it,” said Public Works spokesman Mike Kaspar. Read Staff Writer Juliette Funes story at JUNK. For the third time this year, authorities have arrested a Hacienda La Puente Unified School District employee on suspicion of workers’ compensation fraud. Police on Monday arrested Alfred Thomas Velasquez, 54. He faces three counts of insurance fraud for allegedly faking an injury so he could collect workers’ compensation benefits. Superintendent Barbara Nakaoka declined to describe Velasquez’s duties at the district. According to Bill Warner, manager of the Special Investigations Unit for the company that handles the district’s insurance claims, Velasquez claimed he injured his neck and shoulder while trying to catch a falling bag of fertilizer in September 2009. Shortly after Velasquez made the claim, an investigator recorded video of him putting up Christmas decorations, some of which appeared to be large and heavy, and hammering stakes into the ground. Those opposed to a Chinese-government-funded teaching program have launched a recall effort against four members of the Hacienda La Puente Unified School District. Organizers last week turned in intent-to-recall forms against board members Norman Hsu, Jay Chen, Anita Perez and Joseph Chang. The form is a precursor to circulating a petition and obtaining signatures for a recall. Petitioners said the effort was spurred by the decision by school board members to support the Confucius Classroom, a Chinese-culture program funded by China’s government. Retired school district superintendent John Kramar said those text books are filled with one-sided propaganda that is approved by the Chinese government. Hard to believe but the students at Nelson Elementary are celebrating the 100th day of school today. The Hacienda La Puente Unified School District is halfway through the school year.